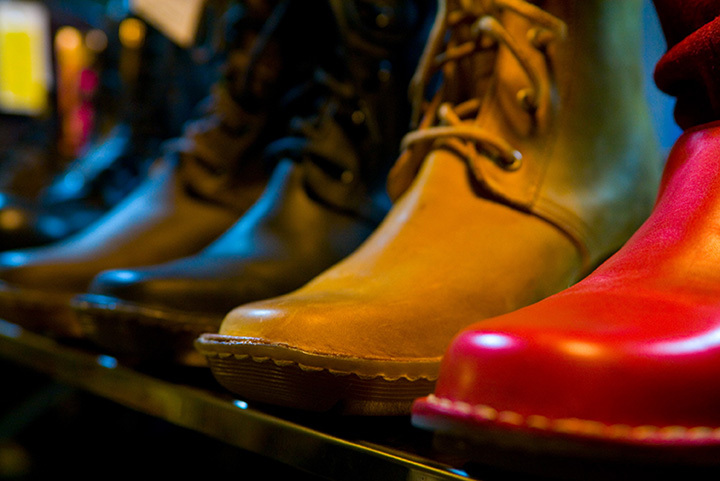 South Carolina’s great local shoe stores will have you strolling out in style. Find everything you need, from designer pumps to rustic work boots to the latest sneakers. Plus, you get the added benefit of supporting small businesses. If you’re looking for new kicks, head to these 10 best shoe stores in South Carolina. You won’t find a more unique variety of shoes anywhere in the Holy City. Situated on classy King Street, Shoes on King is a designer shoe boutique with new collections every season. Specializing in women’s shoes of all colors, sizes, and styles, you’ll have a hard time not finding a few new pairs to add to your closet. They’ve made shoe shopping a spa-like experience. Step through their doors and feel instant Zen as you peruse their meticulously displayed footwear. They carry some of the best names in shoes, including TOMS, EMU, Vaneli, and more. You won’t find another place quite like it. Shoes and accessories are always in bloom at Blossom. They’ve got the latest styles, offering an eclectic variety for every shoe fanatic. Their fans love them because of the personalized service they receive every time they visit. This place is everything a ladies’ shoe store should be. Find your inner shoe muse here. This artfully designed shoe boutique is picture perfect in every way, offering some of the best shoe fashions in the city in a high-end setting. They’ve also got a sweet suite of jewelry to complement your new purchase. Specializing in all things safety shoes, this is the best place to buy work shoes for manufacturing jobs, construction, the restaurant industry, and other hazardous careers. They feature brands and styles for men and women alike, and will even ship you your order for free. Find locations in Lavonia, Seneca, and Suwanee. Catering to children’s footwear needs, this place knows how to take the stress out of shoe shopping. Their vibrant, whimsical interior makes trying on shoes for kids less of a chore and more of an experience. They’re a one-stop shop for best-in-class brands for babies, toddlers, and big kids alike, and even children who need orthotic shoes. This high-end sneaker boutique adds style and sophistication to every pair of shoes they sell. Every item in the store is hand-selected, meaning you can expect to find popular Charleston fashions you’ll actually want to wear rather than a generic one-size-fits-all outfitter. Offering sneakers for both men and women, you can also find men’s streetwear and accessories here. Good shoes don’t have to cost a paycheck, and no one knows this better than Bargain Shoes. They carry top brands like New Balance, Sanuk, and Frye, among many others. Their fans love them because of the huge selection and low prices. This shoe store has a mission, and it’s not just to sell shoes. Having started as a local shop where shoes were made by hand, this award-winning shoe store is still known for their professional fittings and attention to detail. They’re the best place in the area to go for orthotic inserts, foot aids, and comfort shoes. Featuring sneakers of all sorts and sizes, you won’t need to go anywhere else on the Grand Strand. Their customers rely on them for popular sneaker brands like Nike, Jordans, and Adidas, to name a few. If you’re looking for the best deal, they also offer a selection of gently used sneakers on consignment that are like new and priced to move.